This is my first blog, a bit late to the game I know, but I've taken an interest in cooking recently, and rather than store everything on note cards, I figured that it would be easier to just upload everything to a blog. Why is it called Hemarchus? Well, all the good blog names were taken, and Hemarchus was one of the principal followers of the Greek philosopher, Epicurus, from which we get gastronomically related words like epicurean... I am no chef, but an aspiring part time hemarchus and grad student. Trying out some new recipes this weekend. They are hors d'oeuvres sized which are more practical in my opinion, because a) they will be easier to entertain with, and b) reduce the amount of food that I have to end up eating should things go terribly wrong. First one is a dessert, miniature peach cheesecake with balsamic syrup. Why this combination? Well, I have a ton of peaches sitting around at home, as well as an unopened bottle of balsamic vinegar that I haven't gotten around to using (until now). Crust: Used some graham cracker crumbs, a packet of sugar, melted butter, and pressed them into the bottom of my Norpro Pan. Baked ~ 10 min. at 350 degrees F, which as it turns out, was very tasty, although slightly too long in my opinion. maybe 8 min. next time would be better. Bake ~13 minutes at 350 degrees F. Remove and let cool, then place in refrigerator overnight to let it solidify. Consistency when removing from the oven should be like a wobbly flan. Makes about 12 miniature cheesecakes. The reason for adding the flour (or cornstarch) as I understand it is to help prevent 'cracking' in the top surface of the cheesecake. An alternative would be to use miniature leak-proof spring form pans and bake them in a water bath, but those are rather expensive. For the topping, peel and slice some fresh peaches, and boil balsamic vinegar until reduced. 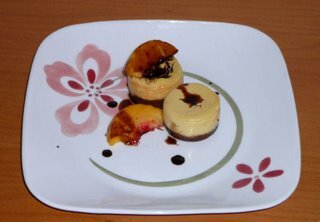 Arrange peach slices as you see fit, and drizzle the balsamic syrup on top.